Abstract: Background The most frequent neurological complication during coil embolization of a ruptured cerebral aneurysm is a thromboembolic event. The association between the tortuosity of the internal carotid artery (ICA) and thromboembolic events (TEEs) during coil embolization of ruptured cerebral aneurysms remains unclear. The present study aimed to investigate the association between extracranial ICA tortuosity and thromboembolic complications during coil embolization of anterior circulation ruptured aneurysms. Methods A cohort of 57 patients with 57 anterior circulation ruptured aneurysms who underwent endovascular embolization at a single institution was retrospectively investigated. Patients were divided into two groups, those who experienced TEEs and those who did not that were compared and analyzed based on patient baseline characteristics, procedural factors, and anatomical factors including those of aneurysms and extracranial ICA tortuosity. The anatomical factors of the aneurysms included maximum dome size, neck width, dome-to-neck ratio, and dome-to-neck aspect ratio. Extracranial ICA angles in the proximal and distal curvature were evaluated as ICA tortuosity. Results Three of the 57 patients were excluded because of unavailability of data regarding ICA tortuosity; 54 patients were finally evaluated. TEEs occurred in six patients with five anterior cerebral and one internal carotid aneurysms. The extracranial distal ICA angle was significantly larger in patients with TEEs than in those without. Procedural factors and anatomical factors of the aneurysms were not associated with TEEs. Conclusions Extracranial ICA tortuosity was significantly associated with an increased incidence of thromboembolic events during endovascular coiling of anterior circulation ruptured aneurysms. Abstract: Incorrect family name of Nino Stocchetti. Abstract: Background 5-Aminolevulinic acid (5-ALA)-guided resection of gliomas in adults enables better differentiation between tumor and normal brain tissue, allowing a higher degree of resection, and improves patient outcomes. In recent years, several reports have emerged regarding the use of 5-ALA in other brain tumor entities, including pediatric brains tumors. Since gross total resection (GTR) of many brain tumors in children is crucial and the role of 5-ALA-guided resection of these tumors is not clear, we sought to perform a comprehensive literature review on this topic. Methods A systematic literature review of EMBASE and MEDLINE/PubMed databases revealed 19 eligible publications encompassing 175 5-ALA-guided operations on pediatric brain tumors. To prevent bias, publications were revised independently by two authors. Results We found that 5-ALA-guided resection enabled the surgeons to identify the tumor more easily and was considered helpful mainly in cases of glioblastoma (GBM, 21/27, 78%), anaplastic ependymoma WHO grade III (10/14, 71%), and anaplastic astrocytoma (4/6, 67%). In contrast, cases of pilocytic astrocytomas (PAs) and medulloblastomas 5-ALA-guided surgery did not show consistent fluorescent signals and 5-ALA was considered helpful only in 12% and 22% of cases, respectively. Accumulation of fluorescent porphyrins seems to depend on WHO tumor grading. One important finding is that when 5-ALA-guided resections were considered helpful, the degree of resection was higher than is cases where it was not helpful. The rate of adverse events related to 5-ALA was negligible, especially new postoperative sequelae. Conclusion 5-ALA could play a role in resection of pediatric brain tumors. However, further prospective clinical trials are needed. Abstract: Facial paralysis is a severe disease and presents a formidable treatment challenge. A wide variety of surgical procedures are available with limited evidence. Major risk factors of suboptimal recovery include the duration of paralysis as well as higher age. In this paper, we demonstrate reconstruction of the facial nerve via an intratemporal end-to-end anastomosis and concomitant transfer of an intact masseteric nerve to the side of facial nerve trunk. The supercharge (reverse end-to-side) transfer resulted in preservation of target muscles and faster recovery. Masseteric supercharge bypass may be an acceptable surgical technique to restore muscle function in potentially higher risk cases. Abstract: Background The probability of favorable outcome after traumatic brain injury (TBI) decreases with age. Elderly, ≥ 60 years, are an increasing part of our population. Recent studies have shown an increase of favorable outcome in elderly over time. However, the optimal patient selection and neurointensive care (NIC) treatments may differ in the elderly and the young. The aims of this study were to examine outcome in a larger group of elderly TBI patients receiving NIC and to identify demographic and treatment related prognostic factors. Methods Patients with TBI ≥ 60 years receiving NIC at our department between 2008 and 2014 were included. Demographics, co-morbidity, admission characteristics, and type of treatments were collected. Clinical outcome at around 6 months was assessed. Potential prognostic factors were included in univariate and multivariate regression analysis with favorable outcome as dependent variable. Results Two hundred twenty patients with mean age 70 years (median 69; range 60–87) were studied. Overall, favorable outcome was 46% (Extended Glasgow Outcome Scale (GOSE) 5–8), unfavorable outcome 27% (GOSE 2–4), and mortality 27% (GOSE 1). Significant independent negative prognostic variables were high age (p < 0.05), multiple injuries (p < 0.05), GCS M ≤ 3 on admission (p < 0.05), and mechanical ventilation (p < 0.001). Conclusions Overall, the elderly TBI patients > 60 years receiving modern NIC in this study had a fair chance of favorable outcome without large risks for severe deficits and vegetative state, also in patients over 75 years of age. High age, multiple injuries, GCS M ≤ 3 on admission, and mechanical ventilation proved to be independent negative prognostic factors. The results underline that a selected group of elderly with TBI should have access to NIC. Abstract: There is a distinct need for new and second-line therapies to delay or prevent local tumor regrowth after current standard of care therapy. Intracavitary radioimmunotherapy, in combination with radiotherapy, is discussed in the present review as a therapeutic strategy of high potential. We performed a systematic literature search following the Preferred Reporting Items for Systematic Reviews and Meta-analyses (PRISMA). The available body of literature on intracavitary radioimmunotherapy (iRIT) in glioblastoma and anaplastic astrocytomas is presented. Several past and current phase I and II clinical trials, using mostly an anti-tenascin monoclonal antibody labeled with I-131, have shown median overall survival of 19–25 months in glioblastoma, while adverse events remain low. Tenascin, followed by EGFR and variants, or smaller peptides have been used as targets, and most clinical studies were performed with I-131 or Y-90 as radionuclides while only recently Re-188, I-125, and Bi-213 were applied. The pharmacokinetics of iRIT, as well as the challenges encountered with this therapy, is comprehensively discussed. This promising approach deserves further exploration in future studies by incorporating several innovative modifications. Abstract: Background There is an ongoing debate on the role of corticosteroids in the treatment of chronic subdural hematoma (CSDH). This study aims to evaluate the effectiveness of corticosteroids for the treatment of CSDH compared to surgery. Method A systematic search was performed in relevant databases up to January 2019 to identify RCTs or observational studies that compared at least two of three treatment modalities: the use of corticosteroids as a monotherapy (C), corticosteroids as an adjunct to surgery (CS), and surgery alone (S). Outcome measures were good neurological outcome, need for reintervention, mortality, and complications. Effect estimates were pooled and presented as relative risk (RR) with 95% confidence interval (95%CI). Results Of 796 initially identified studies, 7 were included in the meta-analysis. Risk of bias was generally high. There were no differences in good neurological outcome between treatment modalities. The need for reintervention varied between 4 and 58% in C, 4–12% in CS, and 7–26% in S. The need for reintervention was lower in CS compared with C (RR 3.34 [95% CI 1.53–7.29]; p < 0.01) and lower in CS compared with S (RR 0.44 [95% CI 0.27–0.72]; p < 0.01). Mortality varied between 0 and 4% in C, 0–13% in CS, and 0–44% in S. Mortality was lower in CS compared with S (RR 0.39 [95% CI 0.25–0.63]; p < 0.01). There were no differences in complications between treatment modalities. Conclusions This meta-analysis suggests that the addition of corticosteroids to surgery might be effective in the treatment of CSDH. However, the results must be interpreted with caution in light of the serious risk of bias of the included studies. This study stresses the need for large randomized trials to investigate the use of corticosteroids in the management of CSDH. Abstract: Serpentine aneurysms of the posterior cerebral artery (PCA) treated by the internal maxillary artery (IMA) bypass are rare. Here, the authors report the case of a 34-year-old male patient who presented with a half-year history of gradual severe headache and right-sided limb monoparesis and paresthesia lasting for 1 week. Preoperative angiograms showed a serpentine aneurysm in the left distal PCA, which was treated with internal maxillary artery-radial artery-posterior cerebral artery (IMA-RA-PCA) bypass followed by parent artery occlusion (PAO). The postoperative course was uneventful; radiological images revealed that the aneurysm disappeared, and there was good graft patency and excellent perfusion of the distal PCA territories. To the authors’ knowledge, this is the first and only case of distal PCA serpentine aneurysm to be treated by IMA-RA-PCA bypass followed by proximal PAO. These findings suggest that IMA bypass surgery is a good and feasible treatment option for serpentine aneurysms of the PCA that can preserve the parent artery. Moreover, the anatomic segments of the PCA and different treatment options available for PCA serpentine aneurysms are also discussed in this study. Abstract: Radiation therapy is associated with the subsequent development of cerebral aneurysms; however, stereotactic radiosurgery (SRS)-associated aneurysm cases have not been well documented, with only 18 cases reported to date. We present a case of intracranial aneurysms with the rupture occurring 20 years after SRS for a growth hormone-producing pituitary adenoma. This is the first report of aneurysms diagnosed following transsphenoidal surgery and SRS for pituitary adenoma. We believe that the aneurysm reported here is a consequence of the SRS treatment, and thus this may be a very rare long-term complication following radiation treatments. 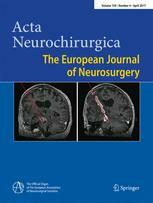 Abstract: Objective To assess the neuropsychological (NP) functioning and quality of life (QOL) before and 3 months after surgery on adults with Chiari I malformation (CMI). Patients and methods All adult patients who had been diagnosed with CMI were invited to participate. Those who participated were assessed using a Hospital Anxiety and Depression scale (HAD) and NP examinations. Their QOL was assessed using the self-reported life satisfaction checklist, LiSat-11 and the five-dimensional EuroQol measurement of health outcome, EQ-5D-5L. All assessments were carried out both before and 3 months after surgery was performed. Demographic data and comorbidities were also registered. Results Of the 11 patients who underwent NP assessment, the majority demonstrated cognitive functioning within the normal range. However, postoperatively, their performance in verbal learning, psychomotor speed, colour naming speed and the ability to manage interference through response selection and inhibition (aspects of executive functioning) was significantly improved. Thirteen patients completed QOL assessments. When LiSat-11 item domains were compared with those of healthy subjects, patients reported a lower level of satisfaction with their life quality both before and after surgery. However, the EQ-5D-5L measurements, i.e., the descriptive system and the visual analogue, indicated that their QOL of life was significantly improved after surgery. Conclusion There is scarcely any literature documenting effects of surgery on the QOL of CMI patients. The study we present here breaks new ground by comparing pre- and postoperative NP functions in CMI. We also examine the value of surgery for improving both NP functions and QOL in CMI. Abstract: Background Decompressive craniectomy is a surgical way to treat intracranial hypertension, by removing a large flap of skull bone. Method We report the case of a 48 years old right-handed man presenting an acute ischaemic stroke of all the right sylvian artery area, with rapid clinic deterioration then coma. Severe intracranial hypertension was confirmed by transcranial Doppler. In emergency, we decided to perform a right-side decompressive craniectomy. Conclusion Six months later, he is in rehabilitation with “only” a left hemiplegia and a very good relational life. His modified Rankin score is 3. Decompressive craniectomy saved this patient’s life, that is why we think this surgical technique must be explained and mastered. Abstract: Background For pineal tumors presenting with hydrocephalus, simultaneous endoscopic third ventriculostomy (ETV) and tumor biopsy is commonly used as the initial step in management. To analyze the restriction which the foramen of Monro poses to this procedure, one must start with a detailed description of the microsurgical anatomy of the foramen in living subjects. However, the orientation and shape of the foramen of Monro make this description difficult with conventional imaging techniques. Method Virtual reality technology was applied on MRIs on living subject without hydrocephalus, as well as patients with hydrocephalus, to generate precise anatomical models with sub-millimeter accuracy. The morphometry of the foramen of Monro was studied in each group. In addition, displacement of the margins of the foramen was studied in detail for simultaneous ETV and pineal tumor biopsy through a single burr hole. Results In 30 normal subjects, the foramen of Monro had oval-shaped openings averaging 5.23 mm2. The foramen was larger in people above age 55 (p = 0.007) and on the left side compared to the right (p = 0.002). For patients with clinical presentation of hydrocephalus, the average opening was 32.6 mm2. Simulated single burr hole simultaneous ETV and pineal tumor biopsy was performed in 10 specimens. Average displacement of the posterior and anterior margins of the foramen was 5.71 mm and 5.76 mm, respectively. However, maximum displacement reached 9.3 mm posteriorly and 10 mm anteriorly. Conclusions The foramen of Monro is an oval-shaped cylinder that changes in size and orientation in the hydrocephalic patient. If universally applied to all patients regardless of foramen and tumor size, ETV/biopsy can displace structures around the Foramen of Monro up to 1 cm, which can potentially lead to neurological damage. Careful pre-operative assessment is critical to determine if a single burr hole approach is safe. Hardback ISBN: 9781626238893 Thieme Publishers New York/Stuttgart. Abstract: The name of Roy Thomas Daniel was incorrectly captured in the original manuscript. Abstract: The superficial middle cerebral veins (SMCVs) are large veins to drain the brain and therefore anatomical knowledge of them is important for neurosurgeons and neuroradiologists. In a patient with a ruptured blister aneurysm, we incidentally found during angiography an aberrant drainage of the SMCVs, which penetrated the lateral part of the greater sphenoid wing and directly connected the SMCVs with the deep facial vein. Neurosurgeons usually need to remove that part of the greater sphenoid wing during the fronto-temporal approach. The existence of a well-developed current channel could be a contraindication for this type of procedure.